We all need a coach. A coach keeps us on track. Keeps us focused. Keeps us reaching towards the goal. We want to learn more about your goals, identify your dreams. Long-term relationships that encourage open and honest communication have been the cornerstone of my foundation of success. Understanding how and where you are spending your money is important to the growth and stability of your business. We provide monthly bookkeeping and financial analysis. This information will help you navigate the myriad of financial landmines. If you don't know where you are, how do you expect to get to your destination? If you received a IRS Notice after tax season, who do you call? You can call File 4 Me. We are open year round. We work on-on-one with our clients to help you solve your issues with the IRS. As an IRS Enrolled Agent, we can help you get relief in any of these areas. The tax code has more the 77,000 pages. Every year Congress passes new legislation that impacts your taxes. As a Tax Accountant and Registered Representative, I understand the tax law and the financial impact it can have on your business. We can help you legally lower your tax liability and increase your refund. Anxious. Stressed. Frustrated. Intimidated. Does this describe how you feel when completing your 1040? At File 4 Me we take the stress out tax preparation. Our focus is on personal attention, education and exceptional service. At File 4 Me, we know your time is valuable. We offer several affordable solutions to assist you with filing your federal and state income taxes. 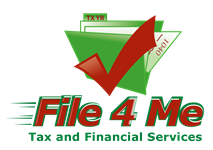 Walk-In…When you visit File 4 Me, you receive responsive, courteous and prompt service from our trained tax preparers. We will sit with you, one-on-one and complete your tax return. Drop-Off…If you prefer to drop-off your W-2 and other relevant income information, File 4 Me will prepare and electronically transmit your income tax return for you. On-Site…At File 4 Me, we want to help you meet your commitment to Uncle Sam. Our tax preparers will travel to wherever you are and prepare your taxes for you. Just call our office for an appointment. Financial Services…As a licensed Investment Broker and Representative, we work though H.D. Vest to offer Mutual Funds, Fixed and Variable Annuities, 401K Rollovers, College and Retirement Planning Services. H.D. Vest is a leading independent broker/dealer providing investment and financial advisory solutions to retail investors through tax professionals located throughout the United States. Recognized as the largest tax professional-focused financial services company and third largest independent broker/dealer in the United States, H.D. Vest provides industry-leading training, technology, and support that enable tax professionals to deliver independent financial solutions to their investors. Click Here for More Information. Year-Round Service…Give us a call. We offer proactive planning and advice that will help you keep more of your money in your pocket.